The Flex-360 offers you a flat-feeling position plus extra storage in a small bed beside you. The Flex-360 combines bridge hammock comfort and flatness with the stability of gathered-end hammocks. You will love the amount of space and the great options for storage. A flex-rod holds the two hammock beds apart, so heavy gear will hang beside you — not against you. Deploy quickly and stay dry, bug-free and perfectly comfortable in this American-made system. When temperatures drop below 60 degrees Farenheit, you can attach the matching Z-Liner 360 underquilt (sold separately) to each bed to stay warm in temperatures down to 0 degrees F (-17 degrees C). Timp-Hitch suspension system includes 2000 lb. Spectra slings and tree straps; Ample hammock bed with independent made from mosquito-resistant fabric; Secondary hammock bed for interior storage or a smaller second occupant; breathable WeatherShield for privacy and extra protection from cold, wind and moisture; two (2) interior storage pockets for small items like phones or water bottles; full No-See-Um netting can be unzipped to foot-end where it stores in a pocket; zippers include double sliders on both sides of the tent hammock; flexible fiberglass poles. Can I put this hammock on the ground when there are no trees? 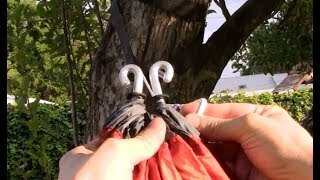 The Flex-360 turns into a bivy tent when you stake it down at the three rope connection points. A Go-To-Ground kit with a sealed ground cloth and stakes is available. What is the secondary bed used for? Use the secondary bed for a smaller adult, a child, a dog, a large backpack, fishing/hunting gear, or other items you prefer not to keep out in the cold. If a person sleeps in the secondary bed, they will be comfortable if they are under 160 lbs and under 6 feet (1.8 m) tall. Do I need three trees to hang this model? No. The Flex-360 hangs between two supports. A flex-rod keeps the two beds apart. Does each bed need to balance? 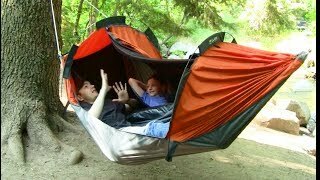 The main Flex-360 hammock bed holds at least 700 lbs. Because the secondary bed is smaller, it’s best to limit the load to 160 lbs. The hammock beds do not require balance. Meaning that it’s okay if one side has a lot more weight in it. What under quilt can I use for this model? The Z-Liner 360 is the correct size for each bed of this model. This liner covers the areas where a solo occupant sleeps, but you can upgrade it to include a underquilt for the smaller secondary bed. I have been thrilled with the Flex-360. I can store all of my gear beside me. At first I thought that would make the hammock crowded. The tent is incredibly spacious and the gear in the other bed stays away from my space. I sleep on my back and also on my side. The incredibly flat positions are so comfortable. Thanks Clark. I’ll be back for the underquilt. Although I already own a 2 person Vertex that I love, it was bigger that I needed for solo trip with me and my dog. When the Flex-360 launch on Kick Starter, I was the first person to put my money down, as this was perfect for my solo trips and I had great faith that Clark would deliver what they promised. I’ve certainly not been disappointed with my purchase and because my partner is a fare bit smaller than me, this will also work when we are truck camping and already have somewhere to throw our gear. The expansion system is simple, lightweight and works and I’m looking forward to spending many hours under the stars in my new hammock. Clark make amazing products that you can sleep flat in and have always been an amazing company to deal with, so I’m happy to give this new hammock the 5 Stars that it deserves.